You can fly to Alice Springs, and drive or join a tour from there. Or you can fly directly to Ayers Rock Airport. Qantas flights depart daily from all major cities in Australia. Yulara, the Ayers Rock Resort, is located 8 km from the park entrance (18 km from Uluru) and offers accommodation at all price levels, from camping to ultra luxurious. If you join one of the Outback safari style tours available you will be camping at a private bush camping site outside the national park. Trip Advisor often has good deals for hotels as well as flights and car rentals. 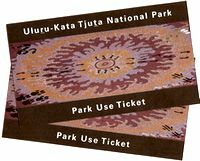 Entry fee for Uluru-Kata Tjuta National Park: A$25 per person. The pass is valid for three days. There are no one day or two day passes. Children under 16 are free. Cultural Centre: located 13 km after the park entrance, and 2km before Uluru. The journey through the "Tjukurpa Tunnel" in the Cutural Centre introduces you to the culture of the Anangu people and Aboriginal law (Tjukurpa). Entry is free, the centre offers great information materials, and brochures about Uluru's history, geology and environment. Climbing Ayers Rock is allowed, but discouraged. The Aboriginal custodians ask you not to. If you choose to climb start early to avoid the heat of the day, and note that the climb may be closed on very hot or windy days, when climbing is considered too dangerous. Uluru Sunset and Sunrise Viewing is only possible from designated parking and viewing areas. You will be told the exact times of sunrise and sunset upon arrival at your accommodation, or you can check at the Cultural Centre. Update: as of September 15 alcohol is banned from all Aboriginal lands in the Northern Territory. The only exception are registered tour operators. If you want to enjoy a glass of wine or champagne with your Ayers Rock sunset you have to join the masses. Another update: (October 30) The authorities have backed down and the four areas overlooking Uluru are now exempted from the ban! You can have your wine and cheese with your Uluru sunset. This short walk starts from the bus sunset viewing area and gets closed for all other visitors one hour before sunset. Walk from the Cultural Centre to the base of Uluru. Short track to a permanent waterhole at the base of Uluru. Rangers conduct daily free guided walks here, starting 8am (Oct-Apr) or 10am (May-Sep). Meet the ranger at the Mala Walk sign. Circles the whole base of the rock. (The Kuniya and the Mala walks are part of the Uluru Base Walk.) Start early and take water! Also located within Uluru-Kata Tjuta National Park is Kata Tjuta, formerly called The Olgas. Kata Tjuta is a 50km drive from Uluru. It consists of 36 steep sided monoliths, which, just like Uluru, look most impressive at sunrise and sunset. Again you have to stick to the official sunset viewing area to see the spectacle. Leads up a rocky slope and then into a shady, moist gully where it ends on a viewig platform. To me this is by far the best walk in all of Uluru-Kata Tjuta National Park. It retains a sense of wilderness and the scenery is just spectacular. Kata Tjuta is nowhere near as busy as Uluru, and if you pick a good time (like very early or late in the day) you may be alone for much of the walk.